Baking is almost a science. You measure and you follow the rules of the recipe, you have to pay attention. After a while you have an idea of the amount of flour or sugar or butter you should use, or of how to use the other, more “exotic” ingredients. But until then it is really important to follow the recipe, especially if you are not sure what you are doing. Before I started baking frequently (almost all the time as you can guess) and learning the secrets of baked goods, I did not know at all that salt is added (in small amounts of course) to sweet recipes, like sweet pastries, cakes, desserts etc.. And now you can also see in the recipes I share that there is some amount of salt in all. First of all, salt acts as a leavening agent, together with baking powder, if you are using regular white flour. Second, salt makes the taste richer. If you are using in a dessert recipe for instance, it makes it taste sweeter and you can also taste the extra ingredients within such as fruits or nuts etc. better. How come? 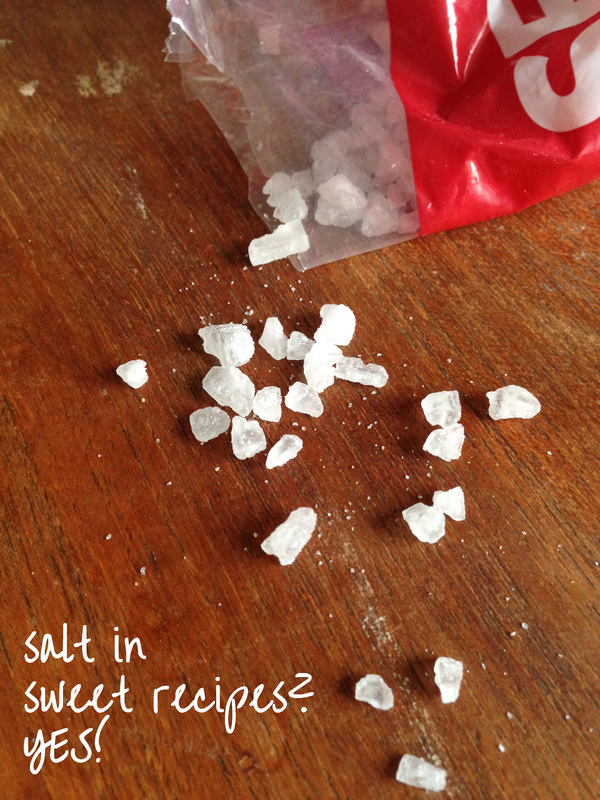 Because salt helps certain molecules of the ingredients release their flavour easier and more. It also suppresses the bitter taste perception, so whatever bitterness there can be in the sweet recipes are decreased by the help of salt. Of course, in those recipes salt is not used in large amounts to actually taste the salt itself. The amount of salt also depends on other ingredients. For instance, if you are using butter and it is salted butter you may want to decrease the salt amount even more. The butter I buy here is normal salted, that’s why I usually use about 1/2 teaspoon or 2.5 ml salt. But if you are using unsalted butter, you can even increase the salt measure to 1 teaspoon, which is 5 ml. Do you have anything to add to this information above, about the existence of salt in sweet recipes? If yes, please comment! Salt=Sodium Chloride, brings out what we call “flavor”. When Sodium(Salt) added to food materials, it quickly dissolves in the water of what material you add, and breaks into small particulars that easily can penetrate into the food. So actually, for instance when we taste meat without salt and taste again after adding salt and like it, what we like is not the taste of meat but the combination of sodium and our food material, whatever protein, lipid or carb it is. More of that, salt also camouflage the feeling what we call “bitterness”, making your tongue receptors effected. Next PostDried Plum and Walnut Cake – It’s A Happy Cake!